I got tired of over-used business plans that nobody read. Tired of marketing plans based on wishful thinking. Tired of task-based project management plans that narrow-mindedly didn't take into account the company's vision. Tired of strategic plans done during plush retreats with a select few that were disconnected with their corporate reality. 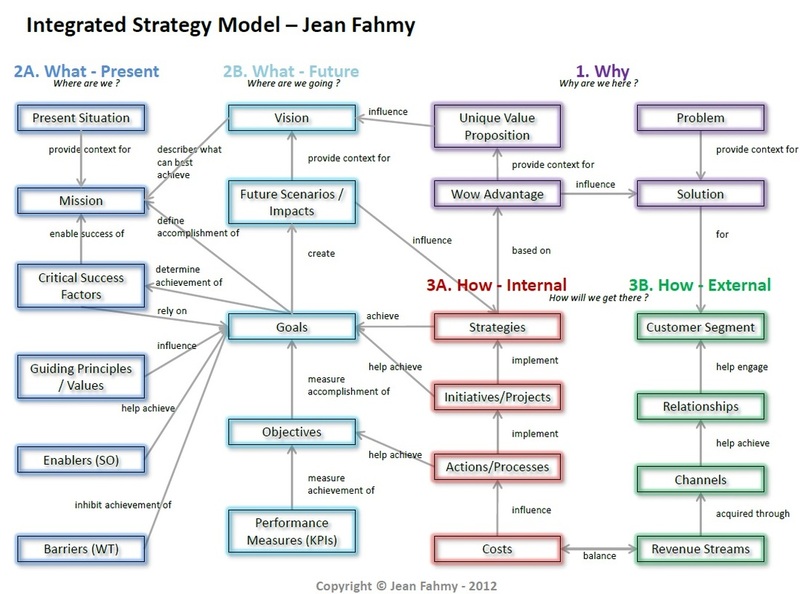 Throughout my career, I have looked to integrate those 'plans' into one comprehensible, integrated, 1-page model. It's an ambitious idea : to develop a model to unite all models. Particularly, I focus on the inter-relationships between the different parts of the model. How does one part of a plan affect the others ? After years of research and vulgarizing exercises, I give you the (continually developed) Integrated Strategy Model (ISM). This model has been tried and tested with many client cases, refined through my experience of finding and accomplishing corporate goals using project management and enabling technology. As well, I have extensively documented the description, the process and the how-to of each box as well as the reasoning behind each link. I have even tailored ISM to digital projects.